The 2000s were a golden age of cars—an era that embraced both modern safety features and design as well as a bygone the-sky’s-the-limit attitude that’s all but vanished today as the world is taken over by electric crossovers. 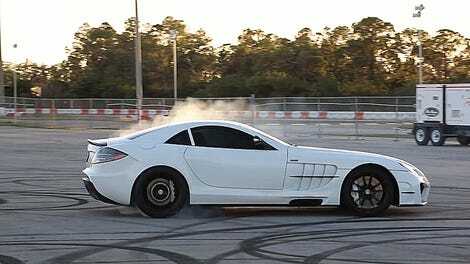 And one of the most glorious results of that time was the Mercedes-Benz SLR McLaren. Thought up in Germany but designed and built in the UK, the Mercedes-Benz SLR McLaren is perhaps the only car to come with a full-carbon tub and a five-speed automatic. It is the child of maybe one of the greatest automotive collaborations in modern memory. Recently, we sat down in an interview with Barry Lett, the chief designer at McLaren while all of this was going on. Lett told us that McLaren’s proposal for a very high performance road car was a rear mid-engine two-seater, reasoning that it would be better-handling than a front-engine GT car. This is not long after the British automaker had built the famed F1, remember. Ultimately, that didn’t happen, and in 1999 the world laid eyes on the Vision SLR concept. It was meant to be a halo car, and it certainly had the looks. During the course of its development process, it was quickly discovered that too much lift was created at the rear. The wind tunnel model was coming off of its runners, so a lot of work had to be done on the diffuser and rear glass. Designers also tried to reduce the downforce at the front of the car. All of this—and the car still had to keep the balance, stability and steering feel that Mercedes wanted. Even McLaren wasn’t sure it was going to work. Ultimately, the finished car had 617 horsepower from a 5.4-liter supercharged V8 and a top speed of 207 miles per hour, but it weighed 3,897 pounds, had a five-speed (!!!) automatic and the engine was in the front. It’s definitely awesome. But next to the Porsche Carrera GT and the Ferrari Enzo, was this even a supercar? McLaren and Mercedes broke up before the SLR finished. Production had started in 2003, but its end was announced already in 2008. Between Mercedes and McLaren, 2009 was the end of the official partnership, but McLaren had already started working on its own road car, the MP4-12C, in 2005. You could call the 2011 SLS AMG its “successor,” but besides a similar profile, the two couldn’t be more different. And I’m not big on gull-wing doors, either. It was also AMG’s first independent venture, so there was a little bit of a different mindset there. Video Producer for Jalopnik. In a committed relationship with her 2007 Nissan Sentra named Layla.